A warm gratitude and welcome to all the travelers, healers, light workers, musicians, artist and beautiful souls around the globe. After the 1st edition of High Mountain Gathering we are exited to welcome you again on the 2nd edition of High Mountain Gathering. High Mountain Gathering is a High Mountain ethnic tribal celebration that happens once a year regularly since ages where villagers around Mount Duralake region pilgrimages 3500 meters above sea levels to the top of the mountain on the first day of Nepali new year (ie: Baisakh 1st, April 14th), with a wish which they believe comes true if reached the peak. With the forest of the mountain all covered by varieties of Rhododendrons, wild spinach, berry, food and flowers they camp there for the night, harvest herb the next day and hike down to village and the mountain again rests in silence for the rest of the year gathering. The mountain is covered with snow for four months of the year yet snow can be seen for six months. It is believed that once a son less Bhramin father of Nine daughter came and prayed the Mount Duralake goddess and was blessed with a son. After for the gratitude he built a temple there where people still pray. High Mountain Gathering gives a majestic opportunity for the visitors to feel the culture of the mountains as it includes a trek of 6-8hrs to the mount Duralake peak through the local villages in the mountains and down to the forest rave next day where you rest or have fun in the gathering in the lap of cozy forest with warm music and peoples. After two nights and three days of music High Mountain drumming Shamans shamanic healing ceremony is followed to clean the aura and bad spirits. The gathering ends at hot spring where we heal the pain and stress of the body and mind with nature. 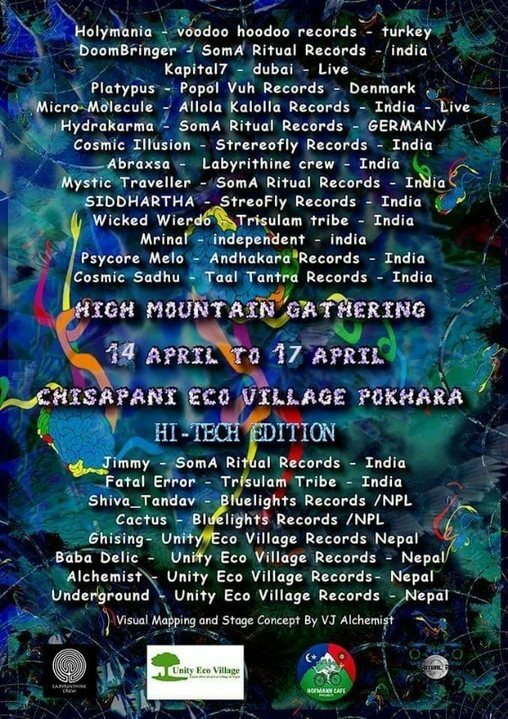 Come together to attend the Mystical hidden mountain celebration that is yet unfolded to hectic world.